My FA Vase campaign started at a rain–soaked Oakwood in Sussex back in September against a strong Chertsey Town side. As you may recall, Chertsey stormed into a 3-0 lead after only 5 minutes, only to be pegged back to 3-3, with the game ultimately, and controversially, abandoned at the full-time whistle. That game set the tone for the run, as I was treated to games of high drama, great entertainment and no shortage of goals. In total, I saw 49 goals hit the back of the net, not including penalty shoot-outs, an incredible average of over 4 goals per game. Quite predictably, attendances started off low (e.g. 65 and 69) but grew steadily throughout the rounds, the largest (after the Final) being 1582 who packed into Glossop North End’s Surrey Street for the Semi-Final 2nd Leg. Fans' interest in the FA Vase really gathered momentum at the national stages and I was extremely fortunate to pick up with Glossop, my town of birth, from the Fifth Round. Any attempts to stay neutral from that point were futile. I have seen some fantastic football and I consider myself well and truly converted to the non League game. At that first game in Oakwood I remember pulling up to the ground and being asked to pay £5. I thought that was the car park charge, and I was a little shocked, before I realised the single blue note I handed over paid not only for the parking, but also for entry to the game and the programme. I parked right behind the goal. A £5 entrance fee was the norm at most games. In all, I watched 12 matches and covered 1778 miles and it was worth every penny. In between the FA Vase ties, I managed to take in other non League games at Chertsey Town, Dartford, Egham Town, Hampton & Richmond Borough, Metropolitan Police, Staines Town, Woking and Windsor & Eton, plus an FA Cup game at AFC Hornchurch. Not a Premier League ground in sight. Oakwood struggled in Division One of the Sussex County League finishing next to bottom, just above Worthing United, winning only eight League games all season. Hassocks also had a difficult campaign in the same League, finishing three places above Oakwood whilst Arundel fared best out of the Sussex trio with a runners-up spot, only two points behind champions Eastbourne United Association. 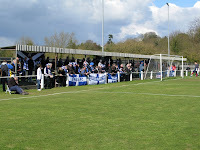 Chertsey Town were amongst the favourites for promotion from the Combined Counties League Premier Division, in no small part due to the amount of money pumped into the club. They finished 3rd in the League behind North Greenford United and winners Bedfont Green as the Surrey outfit limped across the finishing line with a congested end-of-season fixture list and a squad depleted by injuries. In the same League, Banstead Athletic coped well with managerial upheaval to finish in a credible mid-table position. There was also a mid-table finish for Cogenhoe United; The Cooks from Northamptonshire ended the season in 9th place of the United Counties Premier League. Bitton AFC, Marske United and Chalfont St Peter can all lay claim to successful seasons. Bitton’s FA Vase run left them playing catch-up in the League. But with a great run-in, Bitton clinched the Western Premier League title, topping the table above 2nd placed Frome Town. Congratulations to everyone down at Bitton. Marske United missed out on promotion from Division Two of the Northern League by two places, finishing in 5th slot. Going into the final few games of the season, Chalfont St Peter were still challenging for the South Midlands Premier Division crown, but a couple of costly draws and a defeat against champions Biggleswade Town resulted in a 3rd placed finish. 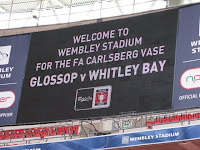 Glossop North End and Whitley Bay not only contested the FA Vase Final, and enjoyed a day in the sun at Wembley, they also enjoyed good League campaigns. Glossop were for a while also in with a shout at the title, but their League form suffered during their marvellous FA Vase run. The Hillmen came 5th in the Premier Division of the North West Counties League, won by last season’s FA Vase winners AFC Fylde. Whitley Bay missed out on a League and Cup double by only two points, the margin that separated them from Northern League winners Newcastle Benfield. Whitley Bay finished 3rd behind Consett. So congratulations to Whitley Bay, winners of the 2008-09 FA Vase. Whilst the teams I watched in the competition had mixed seasons, it was a pleasure to see them all and if it hadn’t been for the FA Vase I would never have considered going to watch any of them play. My abiding memory is the warmth with which I was welcomed at all the clubs, no matter which part of the country nor at which stage of the competition. To the clubs, officials, volunteers and fans that I have met along the way, thanks for your support and friendship. It has been a real joy to share a small part of your season, and most importantly, to share your passion. I fully expected that anti-climactic, end of journey feeling after the FA Vase Final, but it still hit me between the eyes like a bullet. A culmination of a little less than 1780 miles covered, and 12 games watched, it really does feel like the morning after. Glossop North End players and club officials no doubt feel the same way having arrived at Wembley determined to leave with the Vase. 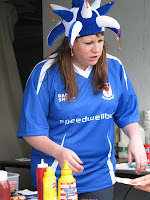 It was Whitley Bay who won the ultimate encounter and it is they who had it all to celebrate come the end of game party. The blue and whites from the North East recaptured the silverware that they won in 2002 and will be experiencing a quite different morning after feeling than their Derbyshire opponents. Both teams produced a display worthy of a Final. Whitley Bay were physically stronger and defensively superior whereas Glossop enjoyed more possession and attacked with pace, but failed to convert their chances. In balance, Whitley Bay deserved their 2-0 win with two good goals but Glossop played their part to keep the 12,212 crowd entertained throughout. The first 15 minutes of the game were rather cagey, but open, as each team sized up their opponents on the large Wembley pitch. Glossop, playing in their new all white away kit, had the first sight of goal in the opening minute, Rick Bailey shooting tamely. Both sides won a couple of corners and free-kicks, but amounted to nothing. Glossop soon began to enjoy space down the left through the ever-impressive Dave Hodges while Whitley Bay were containing well and looking dangerous on the break. 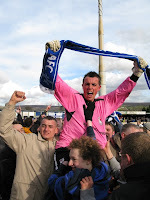 Although both teams were keen to attack from the off the first talking point of the game didn't arrive until the 16th minute with what was almost a spectacular goal; Adam Johnston produced a great strike from inside his own half which had the Glossop keeper Matt Cooper frantically back-peddling. Cooper somehow managed to get back to push the ball onto his bar. Glossop were the next to strike the woodwork, after 21 minutes. Nick Allen drifted in from the right and with his left foot struck the bar with a rising shot from outside the area. A couple of minutes later Darren Hamilton got behind the Whitley Bay defence to square across goal but none of his team mates had joined him in advanced positions. Clear-cut chances were at a premium for either side; Glossop were enjoying most of the possession but Whitley Bay broke well and won a couple of corners. The game was really end-to-end by this stage, and Glossop almost opened the scoring when Hamilton forced Terry Burke to smother at the foot of the post. With ten minutes of the half to go, Dave Morris fed Hodges down the left, but his cross was well held by Burke who was by now the busier keeper. But it was Whitley Bay that broke the deadlock, and it took a great piece of individual skill to do so. Paul Chow’s ball found Lee Kerr on the edge of the North End penalty area. Kerr flicked the ball neatly between his two markers (Jamie Kay and Jay Gorton) and into the box, and with his next touch fired a sweet low shot across Cooper and into the corner. 1-0 to Whitley Bay after 36 minutes. Glossop responded well and again looked to attack. Rick Bailey and Hamilton frequently exploited space on the right and with 3 minutes to go before the break it was Rick Bailey who jinked into the area only to scuff his shot. But just as the scoreline looked to remain intact through to the half-time whistle, Whitley Bay doubled their advantage. Glossop could so easily have equalised though; a scramble in the Whitley Bay box fell to a Bay, rather than a North End, player. The clearance found Johnston in space and with the two holding Glossop defenders isolated, he slipped the ball inside to Chow. Chow controlled the ball and finished well, hitting his shot beyond the reach of Cooper. In a harsh few moments for Glossop, Whitley Bay found themselves in the driving seat. Glossop really needed an early break in the second half to get back into the match, but it was Whitley Bay who emerged the more determined. By now it was evident just how strong the Whitley Bay defence were, particularly their centre-half pairing, who coped with everything thrown at them. 2-0 almost became 3-0 within a few minutes of the restart as Chow waltzed into the area to shoot just over the bar. Glossop slowly played their way back into the tie and grappled back possession for a spell. Gorton put an effort wide from distance and on 54 minutes Rick Bailey broke into the area only for his shot to be deflected for a corner. Then back up the other end and it was the seemingly tireless Johnston who almost sealed the game but Cooper again saved well. As the game reached the hour mark, Glossop’s constant running on the lush surface started to take its toll and they visibly began to tire. After 67 minutes the crossbar rattled yet again when Chow, the man-of-the-match, headed against the frame of the goal. Moments later Chow found space in the box to head a cross just over. With Whitley Bay now in control they created further chances from set pieces. But just as it seemed that Glossop were running out of ideas and out of legs, and their fans had been silenced, they enjoyed an exciting spell of pressure from around the 76 minute mark. Hodges broke free, refusing to give up, and clipped the ball over Burke, but also over the goal. On 79 minutes, Hodges sent in a deep cross and Burke, who had been solid up to now, dropped the ball which was finally scrambled away. This spurred Glossop on for one last push. In a barnstorming finish they forced four successive corners; the Glossop fans were now on their feet and I felt that at least a consolation goal should be their just reward. Half-chances fell to Mark Balfe and Tom Bailey, but this was just not going to be their day. The Whitley Bay defence held firm to the whistle which, when blown, was greeted by the large travelling support form the North East with cheers loud enough to be heard back home. The Glossop fans were magnanimous in defeat and stood to a man to show their appreciation their own team’s not inconsiderable effort, not only in this game but in their whole FA Vase campaign. In a nice touch at the end, both sets of players went to applaud the opposing fans and both sets of supporters responded well. My trip to Wembley was a family and friends affair, making the short journey from Surrey to North London in plenty of time to sample some of the pre-match atmosphere and the fine weather. It was a strange experience for me watching the game in the stadium that was well under a quarter full. My previous visits had been for one of last season’s FA Cup Semi-Finals and the Final itself, when I had seen the place full to the rafters. On this visit I had to remind myself that both teams, Step 5 clubs remember, were extremely well supported on the day and the 12,000 plus attendance was a respectably healthy figure. Yet I couldn’t quite nail why this eerie, cavernous sensation troubled me. We were sitting behind the goal in the West End of the stadium, and I thought that it was because we were almost at the edge of the Glossop support, with the empty seats stretching away to our right, that I felt a little exposed. It wasn’t until later I realised why I had felt that way: the Wembley Final had been far removed from the games I had seen at the small grounds on route. That intimacy had gone; standing against rails, chatting with the club Chairman, players at touching distance and the smell of the Wintergreen. That was it. However, there was never any doubt in my mind that the Final should have been anywhere other than at Wembley, but I may well write to the FA to ask why they couldn’t have done more to get those empty seats filled. So there you have it: Whitley Bay are the 2009 FA Vase winners. The Final turned out to be a great advert for the non League game, which is in keeping with everything I have experienced throughout this season’s FA Vase competition. Well done to The Seahorses but credit must also go to The Hillmen, not only for playing their part in an entertaining Wembley Final, but for being fantastic hosts in the latter rounds of the competition. I can now banish those morning after blues safe in the knowledge that I have been on another enthralling journey. A journey that started for me back in September in front of a crowd of only 65 and gave me the wonderful opportunity to meet people who all share the passion, many of whom I hope to keep in touch with. A journey that has taken me and my friends from Surrey to Gloucestershire, from Sussex to Derbyshire and ended with the trophy heading off to North Tyneside. For more of my photos, please click [here]. There are few sports that impassions as much as football. From players to fans, managers to commentators, the game hauls you kicking and screaming, blubbing and weeping through the emotional mangle. The game tugs at every sense in the same way as compelling film, dramatic theatre or a gripping read. It matters not where you are; on the terrace, in the dugout, on the pitch, in the front room or in the pub. In the aftermath of the emotional eruption at the end of the Chelsea-Barcelona game midweek, there have been a million-and-one flavoured reactions to the Stamford Bridge shenanigans. I can understand the huge disappointment of Chelsea fans and players. I can understand how painful it must have been to be so, so close to playing in the Champions League Final in Rome and then have the dream snuffed out at the death. I can also understand how Darren Fletcher must be feeling after his Rome dream was also snatched away by a poor refereeing decision in the other Semi-Final. And while the debate rumbles on about the over-reaction of the players, the inability to control high emotion, how the role models for our children should, or should not, behave, part of me struggles to be sympathetic for these guys. At that level of football, at the pinnacle of the game, the players enjoy unimaginable wealth. They have their yachts, their Ferraris, their luxury apartments. They play at a standard of football that suggests, if they miss out on this year’s Champions League Final, they should get a reasonable chance to have another crack at it before their career fades. And they will experience other ‘huge’ games. There is no doubting their passion for the game, their gut-wrenching disappointment at seeing something they have worked so hard for come to nothing, but they have a couple of safety nets to cushion their fall. I tried hard to feel very sorry for Chelsea, but I failed. 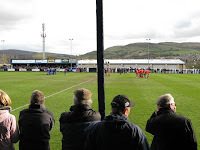 In the build up to the Glossop North End v Whitley Bay FA Vase Final on Sunday – it is here at last – I have been reminded how the emotion of football can really hit home. Whilst the Champions League stars seem so removed from reality, the players who ply their trade in the non League reaches of English football, and the fans who watch them, are not averse to exactly the same level of emotions. The joy, the despair, the ecstasy and the distress. For many who watch this level of football I would argue the emotion is closer to hand, it is easier to share and feel part of, and therefore it seems more real. Pause and think for a minute how the Glossop and Whitley Bay players must be feeling this very moment. They are two days away from playing at Wembley. They do not get paid to play the game they love. This really is a ‘once in a lifetime’ opportunity. Likewise for the supporters and club officials. 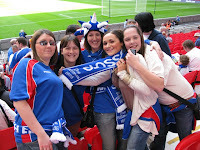 Who would have thought they would ever be able to say “I’m going to watch Glossop play at Wembley on Sunday”. Think also for a minute therefore of the players and fans of Chalfont St Peter and Lowestoft Town who lost in the Semi-Finals. Try telling me that they felt any less hurt, any less upset or dejected than those associated with Chelsea do this week. 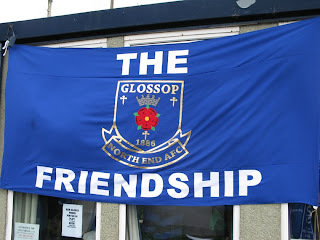 This week I posed some questions to a couple of unsung heroes up at Glossop North End FC. Jonathan Haggart and Neil Rimmer are two of the volunteers who spent most of their spare time and waking hours working behind the scenes at Surrey Street. The latter stages of this FA Vase run has seen their workloads balloon to popping point. I asked them both how they felt about this FA Vase run, what it means for the club and the fan base, what the high and low points were. Their responses included facts about improving attendances, the financial benefits and the plans for ground improvements. However, the single most powerful message that pervaded the responses was the emotion that the whole FA Vase experience has wrought. I asked Neil how he feels about Glossop’s FA Vase Run. “Proud” he said “for all the volunteers who started the season helping out a struggling step 5 club and who now get the reward of a trip to Wembley. For all the supporters who were supporters before Vase mania took over. For all the players that have played at Glossop this season because they love the place, and the beautiful game, and who now get the reward that their efforts and commitment deserve”. Here’s Jonathan talking about that win over Chalfont in the Semis: “And then we scored and all hell broke loose. The emotion I felt when Kelvin scored was overwhelming...but mostly it was bewilderment. There have been many days that I'll never forget on this run, but that moment will be vivid when I'm 102”. And what about the big day on Sunday? “This is everything I wanted as a kid," explained Jonathan "but I was never nearly good enough as a player. To do things as an official...drive up Wembley way, visit the dressing rooms, sit on the benches, and maybe even step on the turf...amazing”. Neil will get to see his own son lead the Glossop team out at Wembley as team mascot. A truly special moment. In a week where football fans around the globe were implored to feel for Chelsea, I was reminded that there is a much more worthy cause. I listened with moist eyes to a montage of Glossop’s FA Vase highlights on High Peak Radio around the same time Drogba was screaming and swearing into our living rooms. At the climax of the piece, as commentator Ben Price’s emotions exploded over the airwaves in reaction to Glossop’s winning penalty, I wiped away a tear in the same way I had done on that day back in early April. On Sunday, when Glossop and Whitley Bay step out under the arch, emotions will be running high, but for all the right reasons. Come the end of the day there will be cheers and there will be tears. If the emotion of the occasion gets too much for me, I’m not ashamed to say that I will end up blubbing like a baby. Football just does that to you. This year’s FA Cup Final will be contested by a couple of familiar names on Saturday 30th May. Chelsea and Everton will follow the example of Glossop North End and Whitley Bay and colour the stadium in swathes of blue and white. Both the Premiership clubs have already graced the Wembley turf when they played their FA Cup Semi-Final ties there a couple of weeks ago. 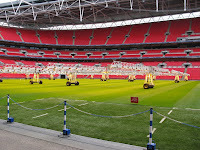 The condition of the Wembley turf was once again a big topic of conversation following Chelsea’s victory over Arsenal and Everton’s penalty shoot-out triumph against Manchester United. I watched the Everton game, and from very early on it was obvious that the Wembley pitch was cutting up badly; players struggled to keep upright and huge divots of turf exploded from the surface at every tackle. I have seen the pitch up close recently myself. I visited Wembley on a non-match day and I was lucky enough to have a tour around. The grass was understandably out of bounds. I was told how new turf had been rolled out following a motor sport event that had just been held there and how the England manager, Fabio Capello, insists that the grass is cut to a precise height, a few millimetres shorter than Sven-Goran Eriksson used to stipulate. The manicured surface was receiving some intense artificial sunlight treatment (see picture above) and the impression I came away with was that no expense is spared nurturing the playing surface, in preparation to host some of the world’s biggest events. So I was rather surprised to see it shredded, like Crispy Duck off the bone, weeks later after the Cup Semis. Much has been written on this subject in the media following the FA Cup games. Wenger called the surface "laughable" and "a disaster". Ferguson felt he had no choice to field a weakened team, blaming the state of the pitch for his decision. Moyes described the turf as "spongy". Only Hiddink from the quartet of managers emerged with any respect explaining that he had experienced far worse surfaces in international football and the grass was "fine to play on". The FA reacted by declaring that the surface will be ripped up and re-laid in time for the FA Trophy Final on the 9th May, the day before the FA Vase Final. It will have a "different composition", apparently. “These managers and people from the Premiership should try and play on the some of the pitches we have to play on every week!” he said. “Compared to those, Wembley will be like a carpet. Our pitch is rock hard at the moment, so Wembley will be perfect for us." The most sensible thing I've heard on the subject. The standard of the surface is relative, it depends upon what you are used to. The nation’s elite walk out onto very good surfaces, week in, week out. It is no surprise, on the rare occasion they travel beyond their comfort zone to play at lower league opposition, they struggle. They struggle with the smaller pitches, with surfaces composed of mainly mud, sand and little grass, the intense slopes and the rutted ground that makes close control well-nigh impossible. For the majority of the season though, the stars play on some of the country’s finest areas of green, lovingly tendered by dedicated groundsmen who have budgets bigger than the combined wage bills of Glossop North End and Whitley Bay put together. To describe the Premiership big boys as ‘spoilt’ is probably the wrong verb to use, but experiencing the slightest problem with the Wembley turf was certainly something they felt wholly justified moaning about. The Glossop and Whitley Bay players are relishing stepping out onto the lush green come the FA Vase Final in a little over a week. Onto a surface that will, to them, feel as smooth and unblemished as the finest velvet. They will struggle in a different way, with the sheer dimensions of the playing area and the longer grass that will sap energy and nutrients from every muscle. But unlike their Premiership counterparts, you will not hear a single one of them complain. 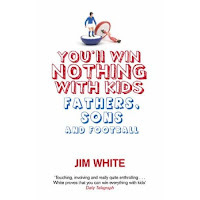 I’ve recently finished the excellent book by Jim White, “You’ll Win Nothing With Kids” a must-read for any parent who has a son or daughter playing junior football. I was given the book as a present and by total coincidence started to read it just as my own son signed up for Chertsey Town Under 9s. The timing could not have been any more apt. The book is an enthralling, touching and a quite hilarious read about White managing a junior team, with a huge chunk of serious observation about the state of junior football in this country. It examines the relationships between fathers and sons, the role parents play (positively and negatively) in the game, the pressure of being a manager, the politics involved in running a junior club and how much it can completely take over your life. And to some extent, I can see everything that White writes about happening to me, my son’s team and the parents of the boys. It is almost as if White stepped into my street and into my world, that he has been amongst us and he has written about us. The ‘us’ that I refer to is a junior team affiliated to the main Chertsey Town football club. Chertsey Town Juniors have effectively been run quite separately from the main club over recent years, but since Spencer Day’s arrival as owner and manager at Chertsey Town, over a year ago, this is all slowly changing. Day is striving to bring the two together, to make the club as one, all the way down from the first team through all the youth ranks to the Under 7s. My son signed up around Christmas time. Before the start of this season there was one Under 9s team, playing in the Surrey Primary League Premier Division. In a move that caused quite a deal of unrest, a group of parents (of the ‘better’ players) broke away from the rest to set up an Under 9s ‘Blues’ team using the excuse that the squad was too large for a single team and two teams could enter the League. Taking with them the coaches and the manager, the Under 9s Blues started the season in the Premier League. The remaining kids and parents cast aside were left with a race against time to organise themselves and enter a team in the League. This team became the Under 9s ‘Whites’ and entered into Division 6 of the League. Parents of the Whites rallied to take on roles of Coach, Manager, Secretary and all the other duties involved in running a team. In the first few months of the season, the Whites struggled. Regularly playing without a full team, results went against them. But the one thing that kept them going was the desire of the boys to simply go out and play football. As the season progressed, more kids registered, including my son. After Christmas, the numbers increased further, the boys responded well to training and a real team spirit developed. Now, in April, with only a couple of games remaining, the Whites are playing some of the best football of the season. They have won their previous 3 away League matches 8-1, 3-0 and 7-1. And the boys are loving it. But there is upheaval in the air. With Spencer Day’s plans to bring all elements of the club together, there are rumours that, come the end of this season, the boys from the Blues and the Whites teams will have a few training sessions together. The intention is that the ‘better’ boys will be selected for next season’s Blues team and the rest will play for the Whites. This will inevitably mean that some of the boys of my son’s team, some of his friends, will move ‘up’ to the Blues whilst some from the Blues will drop ‘down’. This has caused a great deal of consternation amongst the parents of the Whites team. They have worked hard this season to build a team from scratch, see the boys grow and learn together and become what is now a very strong team. Emotions are running quite high and realistic questions are being asked. Why break the team up? Who decides which are the ‘better’ players? Are the Blues really the stronger team now? Why can’t the ‘better’ players join the Whites from the Blues? This kind of selection process is a staple part of the football diet; this is simply how football operates. Picking the best, the fittest, the fastest, and the most skillful. It is something I have never given much thought to before. But to see that process operate in junior football, especially with kids who are only aged 8 and 9, I’m not convinced it is totally necessary. There is so much pleasure to be gained watching your own son play football. I have being doing so primarily as a parent this season, but as with Jim White in his book, I feel myself slowly being dragged into the ‘committee’ side of things. I have taken training; I have taken control of the team when the manager is absent. I sense my involvement with the team may increase next season as the current manager is due to step down. There have, however, been some disturbing things that I have witnessed at this level. The grief that referees get from coaches and parents; the amount of shouting and screaming from the parents themselves, most noticeably at their own children; parents (and I include myself here) quite clearly living their own football dreams through their children. This can, on matchdays, at times make for quite a stressful hour or so when we should all be having fun. On Saturday and Sunday mornings our parks and open spaces are filled with junior football games, but with the touchlines packed with noisy, annoyed, red-faced parents. Is this the most conducive way to inspire our footballers of the future? It is more likely to put kids off. In “You’ll Win Nothing With Kids” White quotes Brian McClair, who used to play for Manchester United and manage the Manchester United youth team. He said “Football is the greatest teacher” and I can fully understand what he means. For children at this age, it’s not all about coaches hollering out instructions from the sidelines. It’s not about baying parents, berating their own. It’s not about kids looking confused as they are bombarded with contradictory instructions: “Push Up!”, “Stay Back!”, “Out Wide!”, “Tuck In!” At this age, they need to understand the basics and be organised with a little structure, but beyond that kids learn by doing what they do best; going out into the park with their mates and kicking the ball around. So at Chertsey Town Under 9s, in amongst all the politics, the talk of the team being ripped apart, the questions about the future, the concerns of the parents, it is very easy to forget the most important thing. The kids want only one thing. One year ago I wrote about the build up to the FA Cup Semi-Final between Cardiff City and Barnsley. 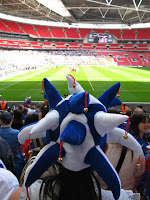 In a slight ‘tongue-in-cheek’ blog post I listed the Wembley merchandise that fans were clambering to get their hands on: the flags, foam hands, car stickers, scarves, replica shirts and the t-shirts. A year on and it would be easy to write exactly the same article, with a few alterations in the detail. Swap FA Cup Semi-Final for FA Vase Final, change Cardiff City to Glossop North End and Barnsley to Whitley Bay. The sense of excitement of a visit to Wembley is the same as it was 365 days ago and the fans’ rush to empty their wallets for any type of memorabilia depicting their club colours is just as palpable. The Final is only matter of weeks away now, but much has already been sorted since Glossop’s quite remarkable Houdini act. On a personal note, I have calmed down somewhat now. I've taken a well earned family Easter break (in Cardiff, coincidentally) and my Vase batteries are fully recharged after they were drained to the dregs up in Derbyshire twelve days ago. So what exactly has been sorted? The Final will be played on Sunday 10th May, kick-off at 2:30pm and, as if I need to say, will be contested between Glossop North End and Whitley Bay. Whitley Bay overcame Lowestoft Town in their Semi-Final, drawing 1-1 in Suffolk to go through 3-2 on aggregate. No doubt much to the chagrin of the FA, we are going to witness an all-northern Final. 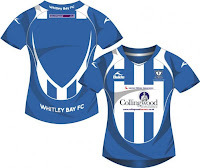 Both clubs share blue and white colours; Whitley Bay won the toss for choice of shirt on the big day so the team from the North East will be wearing their home strip (see picture above). Glossop will be wearing a gleaming new white away kit. 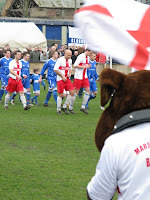 Glossop are the designated ‘home team’ and will therefore occupy the home changing room, even though both Wembley changing rooms are identical. The match will not be shown live on TV, although Setanta have the TV rights so may well screen highlights after the event. Both sets of fans are now ready to buy their Final tickets which go on sale at the respective clubs within the next few days and the clubs have received an initial allocation of 5000 each. There is a long tradition at FA Vase Finals for the teams’ support to be swelled with fans from local teams and for supporters to represent their League. 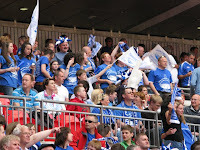 Therefore expect also to see fans at Wembley from a number of North West and North East non League clubs. In addition to tickets, orders are also stocking up for the Wembley Final merchandise. In Glossop, the range on offer include both home and away replica shirts, Vase t-shirts, Vase mugs, scarves, rosettes, car flags, car sunshades, badges and jester hats. The only thing missing is a Vase rattle. In Whitley Bay they have a similar range, but also have key rings, caps, gloves and air fresheners to entice. Add to this the blue and white wigs and face paint and there is no doubting which colours are going to dominate the Wembley scene. It promises to be a marvellous occasion for both clubs and their supporters. There has been a great deal of good natured banter already between opposition fans, which is exactly how it should be, and come Sunday 10th May two trails of blue and white will set off south to ultimately converge in North London to share a special day. 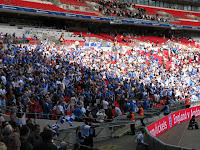 For me, it is fitting that I started with Chertsey Town who also play in blue and white; my (and my friends') trail to Wembley has been rather haphazard and wonderfully unpredictable. 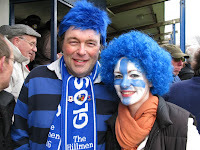 Proudly displaying their club colours in a myriad of different ways, supporters from Glossop North End and Whitley Bay intend to make the very most of every moment of a day out at Wembley. And just like the Cardiff City and Barnsley fans a year ago, they have every reason to. Brian Clough famously said "it only takes a second to score a goal". In a split second a game of football can turn dramatically. Yesterday, at Surrey Street, in the very last second of extra-time in the 2nd Leg of an FA Vase Semi-Final, Glossop's Kelvin Lugsden scored a most unlikely equaliser. In one fleeting moment, in an instant, a course of events was altered beyond all recognition. Chalfont St Peter were moments away from a big day at Wembley but then, in the blink of an eye, their dreams were snatched away. The tie went to penalties, Chalfont never recovered and Glossop's Rick Bailey converted the winning spot-kick to spark scenes of mass celebration amongst the home support. Glossop were now the ones in dreamland. In a single second, despair had turned to ecstasy, joy to heartbreak. Football: bloody hell! Don't you just love it? To be frank, this wasn't a classic game. It was an edgy affair and the occasion, and all that was at stake, seemed to weigh heavily and stifle proceedings. But don't for one second believe that this wasn't entertainment of the highest order. With both teams locked at 3-3 after the 1st Leg, this really was a case of winner takes all. For the victors, a day at Wembley on Sunday 10th May was the prize and this fact alone provided a back-drop for an afternoon of high drama in the High Peak. Whilst the 'Car of Fun' was being inflated up in Glossop, the 'Car of Idiots' was being loaded up with me, PB, Mackem and Posh Mate for a 200 mile trek from Surrey to Surrey Street. My desperate battle to retain a degree of neutrality whilst attending these FA Vase games was thrown completely out of the window by the time we had reached Watford Gap. The thought of seeing my home town club, Glossop, step out at Wembley was too much to bear and the mixture of excitement and nervousness was palatable. Copious renditions of 'Viva GNE' were starting to annoy my passengers before we had even exited the M25; by the time we reached the M1 I had been physically abused with some Chili Doritos and bag of Wine Gums. So can I offer a neutral match report? I'll try. The records will show that Glossop stormed into an early lead, Rick Bailey firing home from the angle after only 2 minutes. Chalfont levelled on the half-hour mark when Terrell Lewis prodded in a loose ball. It stayed 1-1 to full-time, 4-4 on aggregate. Into extra-time, Chalfont scored what seemed to be the winner on 101 minutes, Charlie Strutton netting for the visitors. Then at the death, a dramatic twist on 120 minutes (plus stoppage time) that saw Lugsden score to haul Glossop back from the brink. Glossop won the penalty shoot-out 6-5, but more on that later. In amongst all those facts, there isn't a huge deal to report on. In almost identical playing conditions to the 1st Leg at Chalfont a week earlier, a strong wind played its part. A fair proportion of the sell-out crowd were still entering the ground when Rick Bailey opened the scoring. Playing against the wind, a free-kick was thrown into the Chalfont box and half cleared. Hodges picked up the loose ball and slipped it into Bailey who slotted home with composure. What a great start for Glossop. A few minutes later Chalfont claimed a penalty when Barry Brosnan appeared to have been pushed in the area, but the referee waved away the appeals. From then on in, neither team managed to get a grip on the game. A lot of the ball was in the air and the wind was the only winner. Martin Parker battled well up front for Glossop, winning many headers with his height, but lacked support. Chalfont, as they did in the first game, tried to outwit the conditions by playing their game at turf level, but made too many mistakes. It was a scrappy affair. On 28 minutes Chalfont's Charlie Strutton found some space in the area only to be bustled off the ball and Ashlea Gotham in the Glossop goal tidied up. But two minutes later, Gotham was tested with a high ball into the box. The diminutive young keeper misjudged the swirling ball and fumbled in an attempt to pluck it out of the air; the ball fell to Terrell Lewis for an easy tap in. Not long after the equaliser, Gotham dropped a cross from Jerome Okimo but recovered well to smother. As half-time approached, Glossop became more wasteful of possession and the visiting 'Saints' began to control the game. Their passing was a little more assured. On 39 minutes the visitors fired a ball into the box; Gotham followed the across his area in the belief it was going out of play. Brosnan reacted sharply to Gotham's hesitancy and got to the ball ahead of the keeper. Gotham was now out of position and a moment of panic ensued, only for the referee to rule that the ball had indeed crossed the line for a goal-kick. The second half was dominated by much endeavour and no shortage of huff and puff, but little real quality in front of goal. On 53 minutes a flicked header from Dave Hodges was gathered comfortably by Chalfont's Mark Oliver. 10 minutes later, Rick Bailey found some space but fired straight at the keeper. Two efforts on the hour mark summed up the nature of the game. Glossop's Jamie Kay shot high and wide from long range; Chalfont's Lee Togwell's effort was worse, shooting higher and wider. His effort trickled out embarrassingly for a throw. With the clock ticking down, Glossop's Kelvin Lugsden headed over and Nick Allen sprang the offside trap only to slip at the vital moment. 1-1 at full-time. So on into extra-time. Chalfont attacked Glossop from the off. On 93 minutes, Lewis shot from a tight angle and Gotham got down well to smother. Alan Hedley then had a free header (95 minutes) but his effort was directed straight into the arms of the Glossop keeper. With 97 minutes on the clock, Chalfont looked certain to score. A mistake from Gotham let in Carl Tasker whose goal bound shot was cleared dramatically off the line with a stooping header from Glossop's Danny Yates. Then, with 101 minutes played, the almost inevitable happened and Chalfont got the breakthrough that they probably deserved. It was agony once again for Gotham who spilled a long range shot from Adam Louth straight to Charlie Strutton who gleefully netted. The small travelling contingent from Buckinghamshire celebrated wildly as the remainder of Surrey Street fell totally silent. With the tie ebbing away from the Hillmen, I thought Glossop had equalised at the end of the first period of extra-time. A corner was met by the head of Hodges. I was right in line with his effort and watched it sail towards an empty net only to see it flash inches over. Maybe it was just going to be Chalfont's day. The second period of extra-time was agonising to watch. Chalfont defended well and seemed odds-on to cling to their slim advantage. With my neutrality strewn across the M1, I joined in the collective nail biting as Glossop's hopes of a Wembely Final receded with every passing minute. On 106 minutes Jamie Kay had a shot cleared off the line, but this only increased the sense of hopelessness for the home side. The Glossop players began to cramp up and became increasingly frustrated with their own below-par performance, and that of the referee who brandished a couple of yellow cards for reasons only he will know. With 120 minutes on the clock, Jay Gorton shot over for Glossop and at that point Glossop's last chance had seemingly come and gone. I wrote in my notepad "Game Over". With almost an additional 3 minutes of time added on to the extra-time, the referee blew his whistle. A few of the Chalfont players rushed from their packed dugout to celebrate the win, but quickly returned, tails between their legs, when they realised that a free-kick had been awarded to Glossop. One last chance for the men in blue? Dave Young punted a long, high and hopeful ball into the Chalfont box. There was the briefest of a scramble before the ball fell to Rick Bailey, who seemed certain to score from a matter of yards. He blasted over, his shot taking a deflection off a Chalfont player on its way. From the corner, Balfe headed the ball back into the six yard box and then, in a heartbeat, Lugsden pounced to crash the ball home. Surrey Street erupted and Lugsden wheeled away with his arms outstretched, his team mates in hot pursuit. Unbelievable stuff. I have to admit that I celebrated like a loon and yes, there were a few tears blurring my vision. There was just enough time for Lugsden to get booked for his celebrations and the final whistle blew. The late, late goal had breathtakingly thrown the tie into the lottery that is penalties. Chalfont went first; John Carroll, Edward Chamlal and Adam Louth all scored as did Mark Balfe, Dave Young and Tom Bailey for Glossop. In front of the packed Glossop end, Chalfont's Lewis Cumber blasted over only for Glossop's Jamie Kay to then have his kick saved. Carl Tasker and Nick Allen netted comfortably for either side; 4-4 after 5 kicks each and into sudden death. The tension was unbearable. Jerome Okimo and Jay Gorton scored for Chalfont and Glossop respectively. Up stepped Lee Togwell for the visitors; Gotham pulled off a magnificent save, pushing the ball around the post. Now was the moment of truth; a physically shattered Rick Bailey slowly approached the penalty spot in the knowledge that his kick could take Glossop to Wembley. He coolly slotted home giving Mark Oliver no chance. Cue Glossop scenes of ecstasy, cue Chalfont scenes of despair. 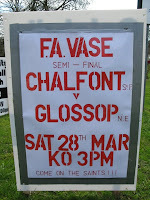 I felt a little sorry for Chalfont; over the two ties they probably did about enough to warrant a day out at Wembley. But that is Cup football and that is why Cup football appeals so much. It turned out to be a quite incredible day, and the game will live long in the memories of Glossop and Chalfont fans alike. When I woke this morning, I thought for a split second it had all been but a dream. As I wrote this article I was repeatedly hit with waves of incredulity. Did it really happen? If I am dreaming, please do not pinch me. 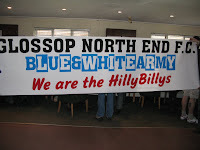 I will see Glossop North End, representing the town where I was born, walk out at Wembley next month. It only takes a second to score a goal but ask any Glossop fan this morning and they will all tell you the same thing: it is dreams fulfilled that last forever. For all my photos from the game, please click [here]. Match highlights are available on TheFA.com website. The equation is straightforward. Glossop North End v Chalfont St Peter on Saturday at Surrey Street. A tie that is precariously balanced at 3-3 after the 1st Leg. 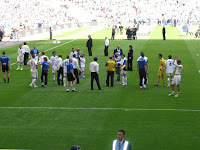 Whoever wins will walk out at Wembley on Sunday 10th May 2009 to contest the FA Vase Final. Not much at stake then. Need I say more? Listening to the radio on Saturday morning it was hard to believe that there were Semi-Finals of a national football competition taking place. The football planet inhabited by the big boys continued to spin like a dervish on its axis as the airwaves were filled with stories about the World Cup Qualifiers, Beckham's 109th cap, the League 1 and the League 2 fixtures. 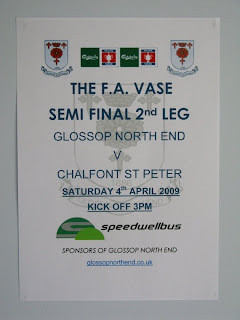 Sidelined in Surrey, I felt the need to check that the FA Vase last four games were still being played and could only imagine what the inhabitants of Chalfont St Peter, Glossop, Whitley Bay and Lowestoft were feeling as D-Day dawned. Yet I needn't have worried. The sound of clicking turnstiles as we arrived at Meadow Mill, the tidy little ground of Chalfont St Peter, prodded at the relative tranquility of the Buckinghamshire surroundings. By the time the travelling blue and white army from Derbyshire had emptied themselves from vehicles into clubhouse, there was no doubting whatsoever there was an important game about to take place. It wasn't long before the first renditions of "Wemberleee! Wemberleee!" pierced the March air. This was game on. Once again, the FA Vase delivered another beauty; final score 3-3, it could have been 5-5 and a tie left delicately balanced with everything to play for in the 2nd Leg. Strangely though, the game took quite some time to find a gear. The weather had a huge part to play, with a very strong (and cold) wind blowing down the length of the pitch. In the first half the home side had the advantage of the wind behind them, and Glossop struggled with their tactic of trying to hit their wide men using the long ball. The only incident of note in a scrappy first 15 minutes was a small hailstorm; I predicted a low scoring affair at this stage. Yes, I know, I am an idiot. 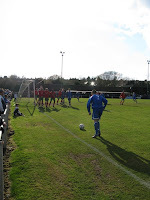 With the wind at their backs, Chalfont could afford to play a very high line; the visitors were caught offside on numerous occasions and Glossop's goalkeeper Ashlea Gotham failed to reach the halfway line with his kicks. Chalfont really had most of the possession and pressure and they opened the scoring on 21 minutes. A shot from the edge of the area was fired in, Gotham reacted well, but the ball fell to Charlie Strutton who prodded home. Glossop failed to string more than two passes together and were half a yard off the pace. The Glossop captain Dave Young struck a long range effort wide on 23 minutes, this being their first real sight of goal. Chalfont played the conditions better; they managed to keep the ball on the floor and brought both wingers into play whenever possible, Terrell Lewis on the right having a particularly good game. Chalfont increased their lead on 32 minutes. A corner was dropped in right on top of Gotham at the near post, but the visiting keeper somehow contrived to drop the ball thus presenting the simplest tap in for Chalfont's skipper John Carroll. Things didn't look promising for Glossop. The massed blue and white travelling support behind the goal had lost their pre-match fervour. The Hillmen were simply not at the races, being beaten by a quicker team and a stiff gale. Disappointingly, Glossop failed to change their approach and still tried the long ball into space behind the back line. The assistant referee's raised flag thwarted them over and over again. But then suddenly, out of nothing, Glossop managed to jam their foot in the door of a game that was closing shut on them. A well delivered corner from Jamie Kay was met with a thunderous diving header from Jay Gorton, right into the roof of the net. 2-1 with 5 minutes to half-time and Glossop had bagged a lifeline. As the teams emerged for the second half one sensed that Glossop, playing with the wind, would now take control and it would be Chalfont St Peter who would struggle. But within 4 minutes of kick-off, The Saints had restored their two goal cushion. Once more, it was sloppy defending that allowed a Chalfont player to turn in the box and square the ball for Barry Brosnan to tuck a shot just inside Gotham's left-hand post. This is just what Chalfont had needed and looked as if they would go on and dominate. Glossop, however, refused to rollover. The game opened up now; Glossop attacking with the wind at their backs and, at last, managing to get somewhere with their wide players exposing the home defence. 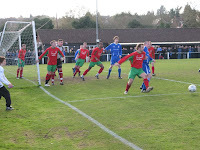 Chalfont still looked dangerous and likely to add to their tally as they managed to break at pace on several occasions. Glossop were in a difficult position now. The next goal would be crucial and the visitors could not afford to concede again. Stick or twist? To Glossop's credit, they pushed on and took the game to Chalfont at every opportunity, in a brave attempt to try and get back into the tie. On 59 minutes a mad scramble in front of the Chalfont goal saw the ball pushed away to Lewis, who continued to threaten. As he advanced on the Glossop goal, he was brought down. 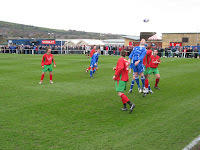 The resulting free-kick was blasted over the Glossop bar. A minute later Gotham horribly skewed a kick from a back pass; he was having a poor game. A Glossop fan behind me moaned "Glossop are not playing very well at all". I had to agree. The clock was ticking down and Chalfont looked as if they were going to hang on and take a welcome advantage into the 2nd Leg. And, just as I thought that, Glossop were back in the game. That long ball to Hodges on the left, which had failed in the vast majority of the game, caught the Chalfont defence napping. This time, the assistant referee kept his flag down and Hodges ran onto the ball and with one touch coolly lobbed the very tall Mark Oliver in the Chalfont goal. The ball nestled into the net and Hodges continued running to the delighted Glossop fans behind that goal. If the game had ended there and then, with 73 minutes on the clock, I'm sure the travelling support would have happily taken a 3-2 scoreline back to Derbyshire. But, quite amazingly, we were treated to a barn-storming conclusion to the game. With Chalfont's heads down, Glossop drew level with 11 minutes to go. Another long ball was the undoing of a tiring Chalfont rearguard and this time it was Tom Bailey who outpaced his marker to slot home. Dramatic stuff and Glossop were well and truly back in the tie. But it didn't end there; both sides could have won it in a frenetic last couple of minutes. On 90 minutes, Bailey again broke through for Glossop only for Oliver in the Chalfont goal to get to the ball first. Up at the other now and Lewis sprinted down the right and Edward Chemial flashed a header inches wide. Edging into the 4th minute of added on time, the excellent Lewis again found space to cross, only for Chalfont's Adam Louth to blaze over. The last action of the game saw Glossop's Sam Hind reach the dead-ball line and cross into a swarm on on-rushing blue shirts. Some tired leg-swinging from the players in blue and some last ditch defending meant that Glossop were agonisingly denied a dramatic last ditch winner. At the final whistle, the reaction of the Glossop players told its own tale; they stood to a man with their hands on their heads. They genuinely felt as if they could have won it at the end and it was Chalfont who probably came off the pitch the most relieved. For me, PB and Mackem, another marvellous afternoon's entertainment. This was a very good game between two committed teams, but I must admit the atmosphere seemed a tad muted, even with such a large and enthusiastic crowd inside Mill Meadow. Maybe the strong wind carried the noise off over the hills? Perhaps the very open ground dampened the sound of the support? It is an understatement to say I am very much looking forward to the 2nd Leg at the more compact Surrey Street where there is everything to play for and where there promises to be an electric atmosphere in front of a sell out gate. I'm sure this FA Vase has another helping of tension, nail biting action and excitement in store. Already the mind games have started; Danny Edwards (the Chalfont St Peter manager) has declared that Glossop "will be favourites so the pressure will be on them". The good news is this: there isn't long for us all to wait to find out. For more of my photos from the game, please pop over [here]. At last, the day of the Semi-Finals is almost here. That First Qualifying Round game at Oakwood last September is but a distant memory. 6 months, 9 games and 1268 miles later, I am off to Chalfont St Peter tomorrow with my good friends PB and Mackem. 280 miles north, Whitley Bay will be hosting Lowestoft Town in the other Semi. At opposite ends of the country, fans from four non League clubs will now being getting really anxious and excited in equal measure. Nothing will be decided tomorrow, as 2 legs need to be negotiated, but even so...Wembley is a matter of 180 minutes away. Deep breaths all round. 1. The G.N.E. Bitter. This is great. 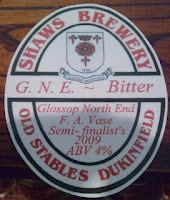 The local Shaws Brewery has produced a special ale to celebrate Glossop's Semi-Final games. They have called it 'G.N.E. Bitter' and it has been well received. Some ingenuous Glossop North End fans are working out how to smuggle a keg or two onto the coach on Saturday. I look forward to trying some! Thanks to Mandy at the Star Inn for the photo above. 2. The Glossop View. I listened with interest after the Semi-Final draw when the Glossop manager, Steve Young, said that he was disappointed with not being at home in the 1st Leg. This a strange thing to hear as the majority of managers and coaches up and down the land normally prefer to be away in the 1st Leg; go to 'their' ground, shut up shop and finish them off at home in the 2nd Leg. Young's take on this was quite revealing; he explained that clubs at this level in the FA Vase really know nothing about each other. His plan was to shock Chalfont in the first game, and he would have preferred home advantage first to execute this plan. By the 2nd leg, they will know far more about each other and there will be no element of surprise. Young still intends to use the shock tactics tomorrow: "It's important that we go to Chalfont looking to win". 3. The Chalfont View. Chalfont have been a little more reserved in their build up to the game. They have a very young team (average age 20) and are based in a part of the country that is not traditionally a hotbed of football. They play in front of crowds of 75-80 but are expecting closer to 1000 tomorrow. 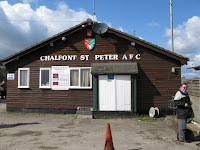 Chalfont St Peter FC are a real community club and over the past 8 years or so, since the current Chairman Denis Mair took over, they have worked hard to build a solid club infrastructure and have developed a sound coaching set up. They do not pay their players. They have been favourites to win the FA Vase ever since the Fourth Round, a tag they are keen to dismiss. Coming from a small community they have had less coverage than other teams in the competition and they believe they are underdogs for the tie. The Chalfont manager, Danny Edwards, has a pragmatic view: "It will all come down to who adjusts and copes best with the pressure". 4. The 'W' Word. I am intrigued to understand how both sets of players, being so close to Wembley, actually feel at the moment and cope with this "pressure" that Edwards talks about. How do they control their nerves, how do they channel their excitement, how do they keep their feet on the ground? Can the pressure be simply too much? I put these questions to two Glossop players, captain Dave Young (son of manager Steve) and Rick Whelan. Both were very clear on this subject; their manager keeps them in check. Using the old cliché, they really do take one game at a time and are still in the hunt for League honours. The manager has them well focused and ensures that their feet are firmly nailed to the floor. Young believes that "whoever conquers their nerves will go through" and the manager has worked hard to ensure the players do not get carried away with things. The word 'Wembley' is well and truly banned amongst the North End players and coaching staff. Mention the 'W' word and a swift £5 fine follows. I wonder how big the kitty is? 5. Prediction? Talking of a kitty, throughout this FA Vase I and my friends have had small wagers to predict the scoreline of games we have been to. In the early rounds, PB seemed to scoop the kitty every time. But after any of us failed to get the score correct at Bitton AFC (2-0 to Glossop) and more understandably at Glossop (5-2 against Marske United), for tomorrow's game there is a double-rollover at stake. On this blog I have never predicted scores, in an effort to maintain an air of neutrality. A bit like Switzerland. To keep with tradition I'm not going to tell you want scoreline I have predicted for tomorrow. However, knowing our prediction skills, and the total unpredictability of this wonderful FA Vase competition, I would guess that we may have another rollover for the Wembley Final in May. As Paul Gascoigne once said: "I don't make predictions and I never will". > What's this site all about then? Does your team get a mention?